Freedom Network welcomes announcement by paramilitary force in Karachi that ‘convicted killer” of Geo News reporter Wali Khan Babar was taken into custody after March 11 morning raid on headquarters of a political party, long been seen as “suspect” for the gruesome murder of the young journalist. 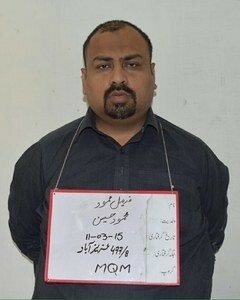 “The reports quoting the Rangers press release giving details of the raid on Nine-Zero , headquarters of Muttahida Qaumi Movement party in Karachi on Wednesday (March 11, 2015) and confirming arrest of reporter Wali Khan Babar’s killer Faisal Mehmood alias Faisal Mota is a welcoming news,” Freeom Network [FN], Pakistan’s first media watchdog organization, said in its press freedom alert. Faisal Mota was convicted in absentia by an anti-terrorism court on March 1, 2014, while giving verdict in the murder case of Wali Khan Babar. 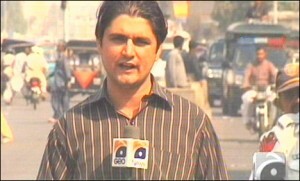 Wali Khan Babar was killed on January 14, 2011, in Karachi after he left Geo News channel office and was on his way to home when gunmen shot him dead. “Arrest of convicted killer of reporter Wali Khan Babar is a victory for justice and the fight against impunity in Pakistan, which has been tagged as ‘one of the most dangerous countries for journalists,’ FN said in the alert. The press freedom organization hailed the arrest and urged the authorities to go after remaining convicted killers of Wali Khan Babar. “Hands attacking media and its practioners must be stopped to let journalism work in fears-free environment and today’s arrest is a good omen for ensuring safe environment for the media in Pakistan,” the alert went on to say.